Last weekend was one of my favorite holidays-Passover. Something about Passover just immediately brings me back to my childhood. All it takes is the smell of chicken soup simmering away on the stove or the pungent smell of horseradish and I am instantly transported back to my home in Western Massachusetts where I can envision a mini-version of myself, wearing one of my nicest dresses, setting the dinner table before the seder. Since I graduated from college, I have made it a point to cook a Passover dinner every year that I have been in Boston (except last year when I was interviewing all over the country) and every year I cook almost the same menu: brisket, matzoh ball soup, and chocolate flourless cake from the April 2006 issue of Bon Appetite magazine. Each year I refine the dishes a little more and try to add something new to the dinner. A few years ago I invented chocolate covered matzoh ice cream which was such a hit, I have made it again every year since then! This year I added in a ribbon of the hot fudge from the hot fudge thumbprints I made earlier this month. Other recipes such as the charoset ice cream with Manischevitz sauce were not as well received. This year, I wanted to add some color and vegetables to the table so I set out to make my first beet dish ever! I actually didn’t really like beets until a few years ago which is probably why I never learned to make them. However, after repeatedly trying them they found their way into my heart and I realized that their earthy taste eventually gave way into a sweetness that paired perfectly with tart and creamy flavors (like goat cheese or yogurt). I decided to get creative with my roasted beets and created multiple components to add varied textures and flavors to the beets. In full disclosure, I hadn’t planned on posting the recipe on my blog. However, after multiple people requested the recipe after seeing the photos that I posted, I racked my brain for the ingredients and proportions and below is what I came up with. Therefore, if you make it, taste is as you go (as you always should) and adjust as necessary! For the roasted beets: Preheat the oven to 400 degrees. Rub beets with olive oil and salt. Wrap beets of same color together in foil packets so they are sealed. Place on a rimmed baking sheet and bake 45-60 minutes until they are fork tender. Cool for 10 minutes and then run under cool water and remove the skins. Cut into 4-6 wedges depending on the size of the beets. For the pesto: Place first 3 ingredients in a mini food processor. Slowly add oil until pesto is of a consistency that can be easily drizzles over the beets. Season with salt. For the vinaigrette: Supreme or slice the blood oranges. Reserve any juice that accumulated while cutting and then squeeze the remnants of the oranges to get more juice. Whisk in honey, olive oil and salt. Honey yogurt: Mix honey and yogurt together. Assembly. Spoon yogurt as the first layer on a large plate. Drizzle with a few spoonfuls of pesto. Top with the cut beets and blood orange segments/slices. Top with a few more spoonfuls of drizzled pesto. Spoon the vinaigrette over the beets. Top with chopped, toasted pistachios if desired and herbs such as parsley or dill (if desired). Every so often you come across something new and amazing that changes your life forever. For me…it was this cookie. You might think I’m being a bit dramatic waxing poetic about a cookie. But this cookie was beyond incredible. Probably the best cookie I have ever had and I’ve had my fair share of cookies. I had wanted to try Mindy’s Hot Chocolate, a bakery and cafe owned by James Beard Award-winning pastry chef, Mindy Segal, for some time. However, its Wicker Park location in Chicago was just a touch out of the way on each of my visits. A few weeks ago, however, I was in Chicago for a conference and discovered Revival Food Hall. Revival Food Hall is a foodie’s dream with several of Chicago’s best fast-casual concepts all under one roof! Everything looked and smelled delicious and I definitely wandered around for a good half hour before deciding what I wanted to eat. However, when I stumbled upon a small Mindy’s Hot Chocolate outpost, there was no hesitation about where I was going for dessert. Deciding what to order was a bit harder, though, because I wanted it all!!! Eventually with some help from the friendly staff I decided on a chocolate chip cookie, a Buckeye bar (aka peanut butter and chocolate goodness), $8 hot chocolate (yes $8 but TOTALLY worth it), and finally, these life-changing Hot Fudge Thumbprint cookies. They essentially taste like you took the best and richest hot chocolate you can find (like their $8 version) and somehow condensed it into a soft and fudgy cookie. Wow! As soon as I tasted it I knew I need to learn how to make them and immediately bought Mindy Segal’s cookbook, Cookie Love, online. The cookies are a bit labor intensive and start with you making about 4 cups of hot fudge (you only need about 1 cup for the recipe so you can make more cookies with rest or use it as ice cream topping…or just eat it with a spoon because it is that good). My hot fudge didn’t quite separate the way it is described in the recipe but after about an hour of simmering (which is longer than what is called for in the recipe) it seemed like it was as done as it was going to get! I made these over 2 days so that the dough could rest overnight. I also added some extra sea salt to the top (because salty and sweet in the best combination) and coated the cookies in green sugar since it was St. Paddy’s Day that weekend. Everyone at work raved about these cookies so I will definitely be making them again! Recipe below is provided by Eater. • In the bowl of a stand mixer fitted with the paddle attachment, mix the butter briefly on medium speed for 5 to 10 seconds. Add the sugar and beat together until the butter mixture is aerated and pale in color, approximately 4 minutes. Scrape the sides and bottom of the bowl with a rubber spatula to bring the batter together. • Put the egg, yolk, heavy cream, and vanilla into a small cup or bowl. • In a bowl, whisk together the flour, cocoa, and salts. • On medium speed, add the egg and yolk to the butter mixture and mix until the batter resembles cottage cheese, approximately 10 seconds. Scrape the sides and bottom of the bowl with a rubber spatula to bring the batter together. Mix on medium speed for 20 to 30 seconds to make nearly homogeneous. • Add the dry ingredients all at once and mix on low speed. Mix until the dough comes together but still looks shaggy, approximately 30 seconds. Scrape the sides and bottom of the bowl to bring the batter together. Mix for another 10 seconds on medium speed. Remove the bowl from the stand mixer. With a plastic bench scraper, bring the dough completely together by hand. • Transfer the dough to a sheet of plastic wrap and pat into an 8-inch square. Wrap tightly and refrigerate until firm, at least 2 hours or preferably overnight. • Heat the oven to 350°F and line a couple of half sheet (13 by 18-inch) pans with parchment paper. • Cut the dough into 6 even strips. Roll the strips back and forth into logs to round out the edges. Sprinkle the smoked sugar on the work surface and roll the logs in the sugar to coat. Using the top half of your thumb as a guide, cut each log into 9 pieces but keep the log together. Roll the logs again to round out the edges, then pull the pieces apart and place cut-side up on the prepared pans, evenly spacing up to 20 cookies per pan. With the tip of your index finger, make an indentation in the center of each cookie. • Bake one pan at a time for 8 minutes. Remove the pan from the oven and tap down the centers with the rounded end of a wooden spoon or a cocktail muddler. Rotate the pan and bake until the cookies have slight cracks on the top and are set, another 4 to 6 minutes. When ready, the cookies will have set around the edges and you will be able to gently move them. Let the cookies cool completely on the pan. Repeat with the remaining pan. • Heat the hot fudge briefly in a pot over high heat until the sides start to melt. Stir well, then transfer to a squeeze bottle or have a teaspoon ready. • Once the cookies are completely cool, squeeze enough hot fudge onto the cookies to fill the indentation or spoon the hot fudge into the center. Refrigerate the cookies until the hot fudge has set, approximately 30 minutes. The cookies can be stored in an airtight container at room temperature for up to 3 days or in an airtight container in the refrigerator for up to 1 week. Dough can be refrigerated for up to 1 week. Hot fudge was one of the first things I learned how to make in my early days as a pastry cook (thank you, Judy Contino), and I’m still fascinated by the alchemy of the process. Chocolate, sugar, syrup, and cream are simmered until the oils separate from the solids. At first it looks like chocolate gone wrong, but then I add butter and a generous helping of vanilla and whisk the whole thing thoroughly. The hot fudge magically comes together. Because the chocolate and cream need to cook for a while, use a sturdy pot to avoid scorching the bottom. Once made, the hot fudge lasts for weeks and weeks in the refrigerator. • In a 6-quart or larger heavy pot over medium-high heat, combine the cream, sugar, and syrup until dissolved, approximately 3 minutes. Add the chocolate and salt and bring to a boil. Lower to a gentle simmer so that the bubbles percolate in the center of the pot. Cook, stirring periodically to avoid scorching the bottom, until the mixture breaks and the oils separate from the solids, 40 to 45 minutes. • Whisk in the butter and vanilla thoroughly (you can also use an immersion blender to do this if you want it extra smooth) and let cool. Hot fudge keeps in the refrigerator for up to 6 months. Yesterday (March 14th) was one of the best holidays of the year (IMO): Pi day!!! I remember first celebrating this holiday in high school in my pre-algebra class. In honor of this momentous holiday, we held a pie making contest. At this point in my life, my love for food and baking was only just beginning and my culinary adventures were mostly limited to easy things like chocolate chip cookies, pizza, scrambled eggs, and brownies. I remember searching through one of my mom’s Pillsbury cookbooks and settled on a chocolate cherry pie with a traditional pie crust and a filling that essentially combined instant chocolate pudding and cherry pie filling. It was quite amateur at best, but somehow I won, mostly because people couldn’t quite figure out what was in it and were curious to find out more. My baking and pie making skills have come quite a long way since then… I would shudder at the thought of using a canned filling now! This year, Pi day happened to fall the day after a huge snow storm. Nothing gets me more in the mood for baking than inclement weather! Luckily I was able to leave work a little early because I had an ambitious pie in mind: coconut cream pie! Since returning from Thailand, I’ve been on a coconut kick and had some coconut milk and cream on hand. I also had some milk, cream, and cream cheese leftover from the last batch of ice cream I made so I didn’t need to brave the blizzard to buy ingredients. I then decided to add a chocolate (black) bottom layer to it because chocolate makes everything better. All of this culminated together in this newest creation: Black Bottom Coconut Cream Pie. What is beautiful about this pie is that it layers rich chocolate, with a sweet coconut pudding, and a light, salty, but only slightly sweet, whipped topping. It is neither too coconutty (this was tested on a coconut hater) nor too sweet. It really is the perfect harmonious blend of sweet and salty with chocolate and coconut. Hope you all had a delicious Pi Day! Small confession: This crust recipe is actually supposed to make 2 pie crusts but I messed up, in a good way, and just made one. The crust is one of my favorite parts so in my mind, more crust is better! If you want a thinner crust (or less butter in a slice of pie), then just use half of the pie dough and reduce the baking time. Mix flour, sugar, and salt in processor. Add butter; pulse until coarse meal forms. Gradually blend in enough ice water to form moist clumps. Gather dough into ball; Wrap in plastic; chill 2 hours or overnight. Roll dough out to about a 12 x 12 inch circle. Fit into pie pan (glass or tin is best). Line crust with parchment paper and then fill with pie weights (or beans, rice, etc.) Bake for 15 minutes and then remove pie weights. Increase temperature to 400 degrees and bake for another 10-15 minutes or until golden brown. Remove from oven and cool completely. While crust cools, make the coconut pudding. Whisk together sugar, cornstarch, salt, and yolks in a 3-quart heavy saucepan until combined well, then add milk in a stream, whisking. Bring to a boil over moderate heat, whisking, then reduce heat and simmer, whisking, 1 minute (filling will be thick). Pour filling into a bowl, then whisk in butter, vanilla, and salt. Cover surface of filling with a buttered round of wax paper and cool completely, about 2 hours. Once the crust has cooled, make the chocolate bottom layer. Place the chopped chocolate in a medium bowl. Bring the heavy cream to a boil in a small saucepan and then immediately pour over chocolate. Let sit for 30 seconds and then whisk until smooth. Stir in the butter and vanilla. Pour into pie crust and let chill for about an hour, or until slightly firm. Next, make the coconut whipped topping. In a stand mixer fitted with a whisk attachment, whip the cream and coconut cream until light with stuff peaks. Next mix in the cream cheese, powdered sugar, and salt and whip until blended. Once the chocolate layer has firmed and the coconut pudding has chilled, pour the coconut pudding over the chocolate layer and then top with the coconut whipped topping. Finally, sprinkle with the toasted coconut and chill up to 6 hours or overnight. 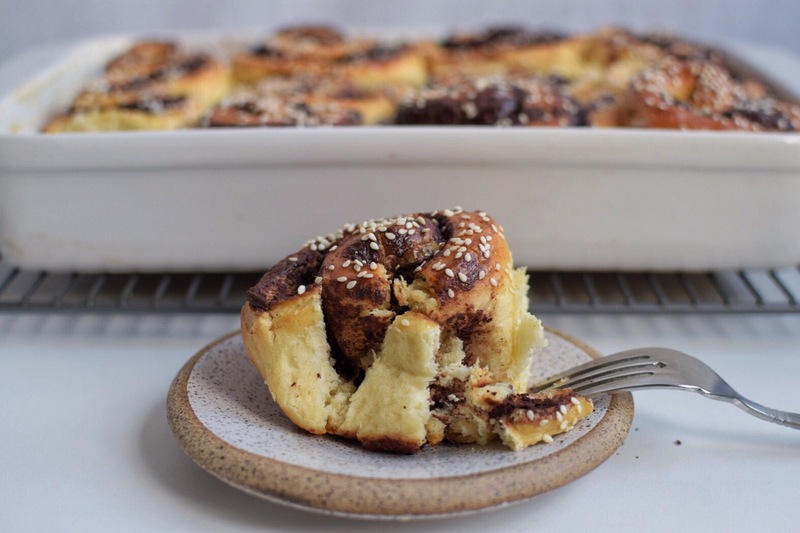 The other weekend on a whim, I decided to tackle a baking project that had been on my list for a while: these chocolate tahini challah rolls by Smitten Kitchen. I have been gravitating more towards tahini in desserts so these caught my eye. Last year I made these tahini molten cakes for dessert after a Middle Eastern themed dinner and they were delicious. For those unfamiliar with tahini, it is a sesame paste that is akin to a natural peanut butter but with a nuttier taste to it. It is often used in Middle Eastern cooking (aka hummus) but has been trending in a lot of desserts lately (see the My Name is Yeh blog). 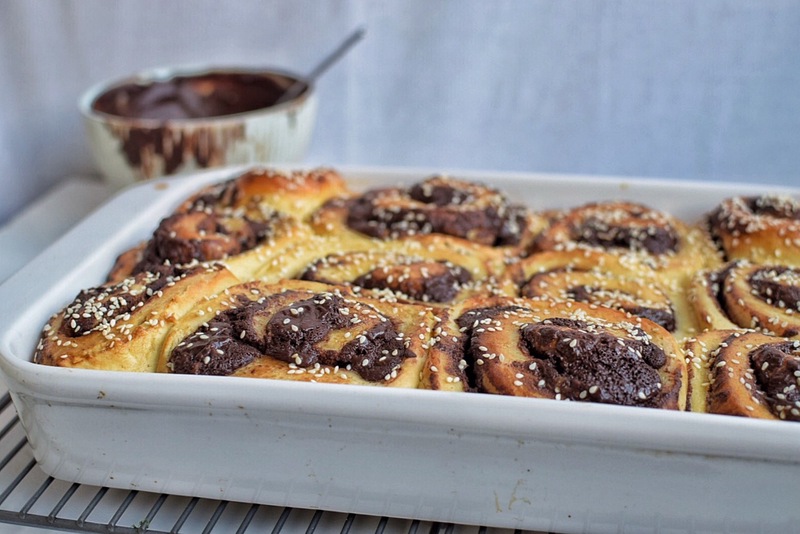 I figured anything with chocolate, tahini and challah couldn’t go wrong! This recipe was pretty simple but does require some advanced planning and time (mostly inactive time waiting for the dough to rise). They are best served warm, in my opinion. Enjoy! Make dough: Whisk eggs, yolk, sugar, oil and milk or water in the bottom of a stand mixer bowl. Add flour, yeast and salt and combine with dough hook until it comes together, then let machine knead it for 5 to 7 minutes. Oil a large bowl and let dough rise in it at room temperature for 2 to 2 1/2 hours, until slightly shy of doubled.You may need 30 to 45 minutes longer if your ingredients were cold. You can speed this process along by turning your oven on to 150 degrees F and turning it off and then placing bowl the dough inside. Keep an eye on it because it will rise more quickly. Butter a 9×13-inch or equivalent size baking dish, or coat it with nonstick spray. Make filling: Melt butter and chocolate together until smooth. Stir in powdered sugar, cocoa and tahini; mixture should be a spreadable consistency. Assemble buns: On a very well-floured counter, roll out dough into a rectangle about 18 inches wide (side facing you) and as far away from you (i.e. length) as it comfortably goes, usually 12 to 15 inches. Dollop chocolate mixture over and spread it smooth. Roll dough in a tight spiral. Cut log very gently — it’s going to be a soft mess, use a sharp serrated knife, sewing thread works well here too — into 1 1/2-inch to 2-inch segments. Arrange cut side up in prepared pan. Beat egg in small bowl. Brush tops of buns and tops of sides with egg and cover with plastic wrap. You can either fefrigerate overnight, along with leftover egg wash or leave it at room temperature to proof for another 60 to 90 minutes, until puffed a bit. Bake buns: If in fridge, remove buns from fridge and let warm up for 30 minutes before baking. Heat oven to 350 degrees F. Brush tops tops of sides with egg with egg wash again (I forgot and skipped the sides, which is why they are pale in the photos) and sprinkle with sesame seeds. Bake for 30 minutes, until bronzed all over and buns have an internal temperature of 190 degrees F. Let cool slightly before serving. To glaze (optional): If using glaze, whisk ingredients until smooth. You can drizzle this over the buns or serve it alongside with a spoon. If drizzling over, it’s best to let the buns almost fully cool before putting it on or it may melt off. It seems I unexpectedly took a sabbatical from blogging… Don’t worry, I’ve still been cooking/baking (although less than normal…)! Life just got a bit hectic to fit photographing and blogging into the mix! The past 6 months have been a bit of a whirlwind with work, fellowship interviews all over the country, a month-long elective in NYC, new photography jobs, a quick trip to Iceland and everyday life. I’ve managed to do some cooking and baking here and there…and obviously a lot of eating! I’ve actually been meaning to post about these Sesame Cashew Bars from Sofra for a few months. Have you ever purchased a cookbook just for one recipe? These bars are that recipe! It was love at first taste for me…salty, roasted cashews paired with smooth, silky caramel and buttery shortbread all together in one scrumptious bite. I bought them one day while strolling through the Boston Public Market and meandering through the produce at Sienna Farms (run by the team behind Sofra and Oleana). They called out to me inside their glistening cellophane packaging. One bite was all it took and I was hooked. I tried to save the rest of the bars by freezing them but it was a futile attempt. Last summer I tried to recreate them by making these caramel cashew bars; they were very good but not as good as the Sofra version. Lucky for me (and my friends), Sofra recently published a cookbook, Soframiz, featuring 100 recipes from Sofra…including these sesame cashew bars!!! I immediately bought the cookbook and made my first batch…and soon a second. They were just as heavenly as I remembered! They are relatively easy to make with only a handful of ingredients- just remember they need to be made the day before you are going to eat them so they can cool. Make The Crust: Combine the flour, butter, brown sugar, and salt in a food processor fitted with a metal blade. Pulse until the butter forms pieces the size of small pebbles, 20-30 seconds. Pour the crust crumbs into the prepared pan and press down to form an even layer. Cover and refrigerated for at least 30 minutes, or up to overnight. Preheat the oven to 350ºF. Bake the crust until golden, about 25 minutes. Set aside to cool. Make The Filling: While the crust is cooling, make the filling. Combine the cashews, sesame seeds, and salt in a large bowl. Mix well and set aside. Melt the butter in a large saucepan over low heat. Add the granulated sugar, brown sugar, and honey, and cook over medium heat, whisking constantly, until the sugar dissolves and begins to turn to caramel, forming large bubbles and thickening, or reaches 240ºF on a candy thermometer. Remove from the heat and whisk in the cream and vanilla. Add cashew mixture to the pot. Using a rubber spatula, fold the cashew mixture into the caramel until well combined. Pour the filling on top of the baked crust in an even layer. Return the pan to the oven and bake until the caramel bubbles along the sides of the pan only and the center is still liquid, 26 to 28 minutes. The filling will appear unbaked. It is very important not to over-bake. The filling will set up as it cools. Set aside to cool completely and then cover and refrigerate overnight. Lift the foil out of the pan to remove the bars in one large block. Cut into thirty-six 1½-inch squares. Store in an airtight container in the refrigerator for up to 2 weeks. They taste best when allowed to come to room temperature for 30 min to an hour. A few weeks ago I met up with my friend Linda who I befriended this summer at a wonderful food photography workshop here in Boston. We have both been eagerly practicing our food styling and photographing since the workshop (i.e. we are major food dorks!) and decided to join forces to whip up, style, and photograph some beautiful baked donuts. After perusing some recipes online, we decided to bake these matcha green tea donuts and baked nutella donuts. Linda bought most of the ingredients (I brought the sprinkles!) and we convened at her lovely house on an overcast Sunday afternoon (perfect for photographing!). She had just visited Mryth ceramics in Allston, MA so we had some gorgeous bowls and plates for styling. I also brought along a few pieces from Ogusky Ceramics (@botonpotter) to round out the setup. First up were the matcha green tea donuts. We had a little extra help from Linda’s dog, Elsie, to make these 🙂 Who knew dogs loved green tea donut batter? I have to admit that we were a bit skeptical of the green tea donuts at first. They were a bit hard to get out of the pan and about half were deemed “unphoto worthy” after removal. After we ruined a few more donuts trialling different glaze dipping strategies, we finally found a method that was both delicious and aesthetically pleasing. We recommend dipping the side that was not face down agains the pan while baking, otherwise the glaze sticks into all the nooks and crannies of the baked donut and doesn’t look great. Next we moved on to the Nutella baked donuts. We were in a bit of a rush to finish these because it was the first day after daylight saving time and we realized sunset was fast approaching! These baked up perfectly round and were much easier to remove from the pan. We went a little overboard decorating them with sprinkles and then ran upstairs to take advantage of the little remaining sunlight. Luckily we were able to get a few shots in before it grew dark. While these donuts were the cuter of the pair, our favorite was the matcha green tea donuts. Linda is already working on tweaking the matcha donut recipe! One other exciting thing that came from our donut making endeavor was that I got my first repost by Food52!!!! Have any of you tried baked donuts? What did you think? Any favorites?